by aviesplace2012 in Uncategorized Tags: Are you a believer or a doubter?, Do you believe what God has said will happen?, Is your faith wavering? I look to Jesus. Hebrews 1:3 says that He is the exact representation of the the Father. Jesus told His disciples that if they had seen Him they had seen the Father (John 14:9), so when we look at the ministry of Jesus we can see the Will of God in action. Jesus Himself said in John 5:19: Then Jesus answered and said to them, “Most assuredly, I say to you, the Son can do nothing of Himself, but what He sees the Father do; for whatever He does, the Son also does in like manner.” Every time Jesus healed, forgave sin, delivered a person from demonic oppression or provided for a need it was because in His Spirit He saw His Father doing those things. He even said in John 15:30: “I can of Myself do nothing. As I hear, I judge; and My judgment is righteous, because I do not seek My own will but the will of the Father who sent Me.” So He said what He heard His Father saying and He acted on the vision of His Father as He did the work. Jesus is the Word of God in action! I visualize Jesus handling the problems of the people: delivering, healing, meeting needs, offering love, forgiveness and encouragement; teaching, preaching and healing.Matthew 4:23-24 NKJV And Jesus went about all Galilee, teaching in their synagogues, preaching the gospel of the kingdom, and healing all kinds of sickness and all kinds of disease among the people. Then His fame went throughout all Syria; and they brought to Him all sick people who were afflicted with various diseases and torments, and those who were demon-possessed, epileptics, and paralytics; and He healed them. Acts 10:38 NKJV “how God anointed Jesus of Nazareth with the Holy Spirit and with power, who went about doing good and healing all who were oppressed by the devil, for God was with Him. To those who were hungry and didn’t have food Jesus took the lunch of a small boy and multiplied it to feed five thousand: John 6:8-11 NKJV One of His disciples, Andrew, Simon Peter’s brother, said to Him, “There is a lad here who has five barley loaves and two small fish, bu what are they among so many?” Then Jesus said, “Make the people sit down.” Now there was much grass in the place. So the men sat down, in number about five thousand. And Jesus took the loaves, and when He had given thanks He distributed them to the disciples, and the disciples to those sitting down; and like-wise of the fish, as much as they wanted. I look forward to the manifestation of His promises to me:Hebrews 10:35-38 NKJV Therefore do not cast away your confidence, which has great reward, For you have need of endurance, so that after you have done the will of God, you may receive the promise: “For yet a little while, And He who is coming will come and will not tarry. Now the just shall live by faith; But if anyone draws back, My soul has no pleasure in him.” But we are not of those who draw back to perdition, but of those who believe to the saving of the soul. 2 Corinthians 1:19, 20 NKJV For the Son of God, Jesus Christ, who was preached among you by us—by me, Silvanus, and Timothy—was not Yes and No, but in Him was Yes. For all the promises of God in Him are Yes, and in Him Amen, to the glory of God through us. 1 Corinthians 14:4 NKJV He who speaks in a tongue edifies himself, but he who prophesies edifies the Church. I pattern my life after those such as Abraham who is known as the “Father of faith”:Romans 4:20, 21 NKJV He did not waver at the promise of God through unbelief, but was strengthened in faith, giving glory to God, and being fully convinced that what He had promised He was also able to perform. Is your faith wavering? If so, maybe these suggestions will help to settle you and establish you so you can stand strong believing that your faith is what John was talking about in 1 John 5:4 when he said that your faith is the victory that overcomes the world! YOUR faith is overcoming faith! YOUR faith brings victory! 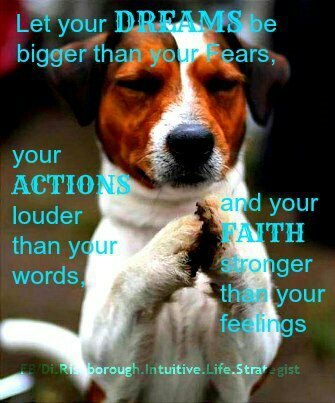 YOUR faith pleases God! YOUR faith moves mountains! YOUR faith carries you through! Don’t give up your faith! Father, I thank You that when I am weak, You are strong and that as I pray, believe and set my heart to receive what You have promised I can be assured that You will do it and I will see what I am believing You for. Thank You for showing me the evidence of Your will in action through the life of Jesus Christ as He ministered to the hurting people of His day. I thank You that He is still the same, even though He is not walking in the physical sense in our world today but that He lives through His Spirit in the hearts and lives of Your people and He is still ministering forgiveness, healing, deliverance and provision for people today! I thank You for showing us Your goodness through the ministry of Jesus Christ and for demonstrating Your great love for us through His crucifixion that we might have an opportunity through faith in Him to be born into Your family. I pray that those who are weak in faith will be encouraged today. I pray that those who are unbelieving will become believers in Christ Jesus today! I pray that those who are wavering in their faith will be strengthened as they apply these principles to their lives. In Jesus’ name I pray. Amen. by aviesplace2012 in Uncategorized Tags: A confession worth making..., Are you confessing the truth or a lie?, It's a faith fight!, What is the spirit of faith? 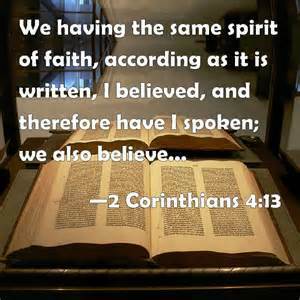 II Corinthians 4:13 AMP Yet we have the same spirit of faith as he had who wrote, I have believed, and therefore have I spoken. We too believe, and therefore we speak. It was at that point that God revealed to me that the same biblical principle that secured my salvation in receiving Jesus as my Savior, by believing in my heart and confessing that with my mouth, would apply to this situation with Josiah. That if I believed that God would heal him then my confession about the situation needed to be speaking the promise of God and not the negative doctor’s report. So I began to proclaim that Josiah was healed by the stripes of Jesus and that he would not die, but live to declare the works of God. (Psalm 118:17) From that point on when people would ask me how he was doing I focused my response more on the Word of God and what we believed for than the medical report. One day shortly thereafter my son called at 3:00 a.m. to say that Josiah had another complication; he was now jaundiced and required a bili light over him to rid his body of the jaundice. The doctor had given them yet another bad report and said he didn’t know when Josiah would be released from the hospital. So as I got in my car to make the two-hour drive to the hospital I began praying in the Spirit in that heavenly language that I had received when I was baptized in the Holy Ghost. As I prayed a holy anger rose up within me towards the enemy in thinking that he was trying to steal my grandson’s life. I began to take authority over his plan to steal, kill and destroy Josiah’s life. Then I praised the Lord for the healing work that He was doing in Josiah’s body. I spent that two hours spiritually fighting through prayer for Josiah and when I got to the hospital I found that the situation had totally changed. The jaundice was completely gone; he was no longer on oxygen; he was fully dressed and sleeping contentedly in a regular crib! Praise the LORD! Josiah was released from the hospital the following day. Today Josiah is healthy and active with no sign or symptom of a lung problem! I praise God for His faithfulness in hearing and answering my prayers! We all have faith challenges in our lives. This was one of many that I have experienced. I have found that God is faithful to keep His word and when He gives me a rhema word, a Spirit-breathed word, a scripture that comes alive within me when I read it, that He intends for me to stand on that word, believe it as truth that will work in my situation right now, and confess it until I see the manifestation of it in my life. That means I must stand strong in faith believing that God, Who is the faithful One, will do what He has promised. Paul said it this way in 1 Timothy 6:12: NKJV Fight the good fight of faith, lay hold on eternal life, to which you were also called and have confessed the good confession in the presence of many witnesses. As believers in Christ Jesus, we are in a faith fight! Every challenge that comes our way is an opportunity to overcome through God’s word, His grace, His Spirit and our confession of faith. 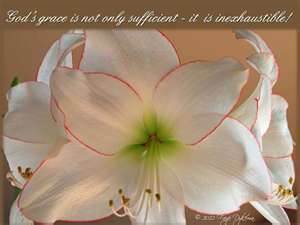 We are to “lay hold” on “eternal life”, the abundant life that God has given us through the crucifixion of Jesus Christ. To “lay hold” indicates to me that someone is out there trying to pull God’s promise of that abundant life from me and I am to fight through faith for what He has given me. Jesus described that “someone” as the thief who comes to steal, kill, and destroy. (John 10:10) As Josiah’s grandmother I went into that faith battle for him. He was a helpless baby who needed someone to stand in the gap through prayer to fight for his right to experience the abundant life that Jesus died to give him. My job was to pray, seek God’s word that would work in his situation, and confess the truth that He had given me! Hebrews 3:1 says that Christ Jesus is the High Priest of our confession. The High Priest stood before God on behalf of the people as an intercessor for them. Today Christ Jesus is taking our stance before God on our behalf confessing that we are children of God, cleansed of our sins and free to come boldly before His throne to receive the mercy and grace that we need to help in our time of need. He is confessing the truth about us! Our part is to align our mouths with His word so our High Priest can take that confession before God’s throne on our behalf. What are you confessing that you want our Lord and Savior Jesus Christ to take before the throne of God on your behalf? Father, I thank You that I have a High Priest, Jesus Christ, who stands before You on my behalf. I thank You that when I align my heart and mouth with the truth of God’s word that my confession becomes a faith confession based on Your word and I thank You for manifesting Your promises in my life as I place my trust in You. I give You praise today for the victory that I have as a believer in Christ Jesus! Thank You for loving me, for saving me and for filling me with Your precious Spirit that I might overcome the battles of life through Your power. In Jesus’ name I pray. Amen.